He had a near death experience and while in the tunnel of light, he grabbed a gold like gem he mistook for a graham cracker and ate it. He promptly returned to his body with new abilities, powers and flight similar to another famous super hero that wears a red cape in blue. But unlike the man in blue with a red cape.. Dean Hero's moral compass is as a turd painted pink. One would assume that being all powerful would go to one's head but with Mr. Hero, it is his lecherous ways that affect his ego. The women he happens to save often become one night stands, and out of these one night stands many children were born. That poses a problem because is Mr. Hero's wife, Lady Volt, is unaware of his other relations, so to hide these from her, he sends his offspring to a Future Baby Drop Off center he created when he broke the time continuum. In this inaccessible place, he has dropped off many children and by giving them the last name of the woman he had slept with, his intension was to retrieve them at a later date. 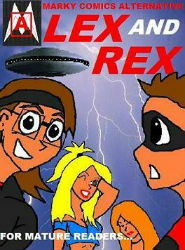 Two of them, however, managed to sneak out, Lex and Rex. Word of Mr Hero's heroics soon spread to other super hero teams. Mr Hero joined those teams (the team with hottest heroines that is...) and established a school to teach others with special abilities how to be super heroes. Enhanced intelligence: Upon eating the gem of immortals, Dean gained super knowledge and super problem solving abilities. Super strength: His super strength is remarkable and has moved objects the size of meteors. Indestructibility: His injury immunity makes him basically indestructible. Flight/Star travel: Mr Hero can fly at speeds that allow him to travel between stars. Time travel: Mr Hero has managed to break the time continuum and can travel to a future where he created a baby drop off center. Weaknesses: As intimidating as he is towards male foes, some female enemies like the F.F.A.S.F. do not fear him as they know he won't strike normal women. He is also fearful of his wife learning about his indiscretions.